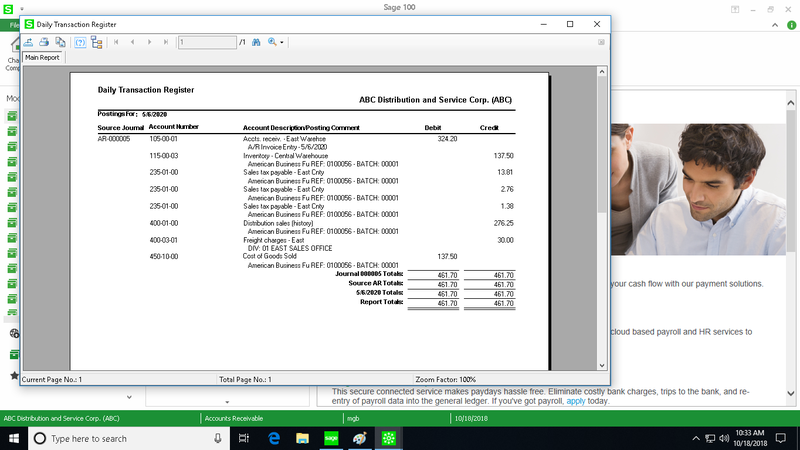 The Sage 100 Accounts Receivable Module allows users to efficiently manage all aspects of accounts receivable, including collections, payment allocation, and all other cash management activities. This straightforward, easy-to-use module helps users track receivables, plan cash flow, and gain powerful business insight through the generation of powerful, useful reports. The flexible search capabilities allows users to easily find the information they desire. The divisional receivables and multiple bank accounts options make running a large organization easy, while the advanced sales tax functions enable you to run your business internationally if needed. You can also accurately track commissions, easily add customers as needed, and automate your invoicing and billing. All in all, the Sage 100 Accounts Receivable Module makes all of your A/R responsibilities easier. Divisional Accounting – Each division or department within your company can be assigned a separate accounts receivable GL account. Cash Expectation Report – Discover how much cash you should be expecting in with a report based on three user-defined aging categories. Advanced Sales Tax – Calculate Canadian taxes, sales taxes in different jurisdictions, and the tax on taxes within this feature. Balance-Forward or Open-Item Customers – Choose whether you want to process accounts receivable based on balance-forward or an open-item basis. International Address Capability – Input international addresses with multiple address lines, country codes, international zip codes, and extended telephone fields. Credit Card Processing for Cash Receipts – Utilize the optional credit card module to accept credit card payments and automatically post them to the corresponding account. Customer Delete/Renumber/Merge – Automatically delete, renumber, or merge customer numbers. Repetitive Invoice Processing – Set up automatic payment terms, discount amounts, and commission amounts for invoices, or use sales codes to find price and COGS information. Invoice Entry – Set up automatic invoicing for recurring invoices. Invoice History Printing – Access the invoice history file for a detailed record of accounts receivable invoices, which provides a record of payment history for each customer, invoice, and invoice dates. Cash Receipts Processing – Process prepayments and automatically apply cash receipts against the oldest invoices or against specified invoices. Statement Printing – Print individual or batch statements for a billing cycle on standard or custom forms. Customer Master File Edit – Identify all changes within your customer master file. Memos – Apply checks, cash, or credit card payments and assign memos to specific customers and certain events. 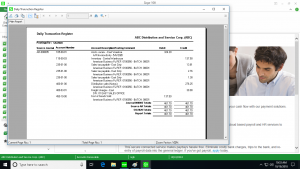 With a full line of Sage 100 training classes, data repair, and support offerings, the Sage 100 support experts at Accounting Business Solutions by JCS can help you use your Sage 100 Accounts Receivable module to its fullest potential. We specialize in Sage 100 ERP, Sage 100cloud, and Sage 100 Manufacturing, and have nine convenient locations nationwide. To get started with Sage 100, call us at 800-475-1047 or email us at solutions@jcscomputer.com .